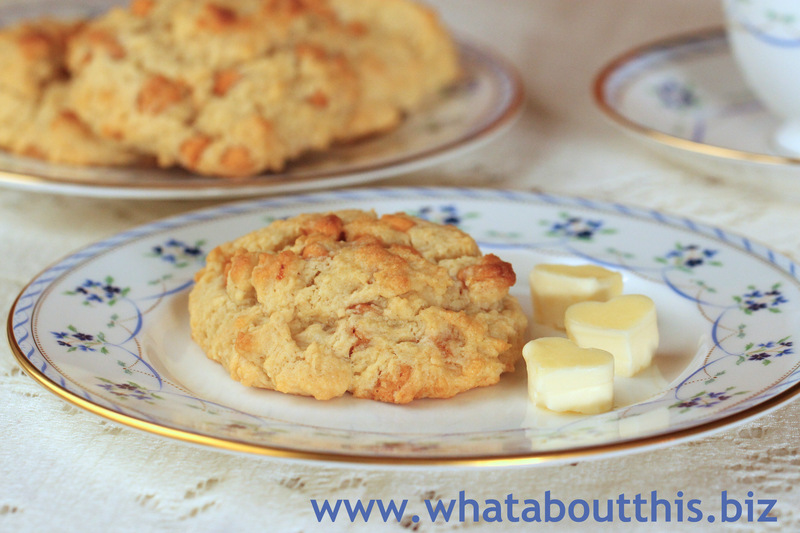 Butterscotch Drop Scones | What about this? The sweet smell of Butterscotch Scones baking in the oven is enough to wake up the sleepy leprechauns in my household. Who can resist the crunchy exteriors and the tender crumb interiors of these scones; not to mention the added treat of butterscotch chips tucked away here and there? Top of the morning to you! 2. Sift all purpose flour, sugar, baking powder, and salt into medium bowl. 3. Add chilled butter; using fingertips, rub in until coarse meal forms. 5. Whisk 1/2 cup cream and egg in small bowl to blend. 6. Gradually add cream mixture to dry ingredients, tossing with fork until dough comes together in moist clumps. Add more cream by teaspoonfuls if dough is dry. 7. Drop dough by 1/4 cupfuls onto large rimmed baking sheet, spacing apart. 8. Bake scones until golden brown and tester inserted into center comes out clean, about 20 minutes. Serve warm or at room temperature. 1. Depending on how true to temperature your oven runs, 20 minutes in a hot oven can be too long. Keep an eye on these while they bake. I set my timer for 10 minutes and checked them. I set the timer for another 3 minutes and they were cooked. Had I let them bake for 20 minutes, they would have turned out dark brown. 2. I got 10 large scones out of this recipe.